It is normally not within the bounds of this column to offer commentary on internal American issues, with the notable exception of consistent advocating of non-intervention in foreign quarrels and stepping back from the assumed role of World Empire. Such policies, harmful as they are to the very fabric of American society, nonetheless do far more damage in target countries, where any "help" that is proffered soon proves to be but another form of grievous injury. Many a harsh word has been expended here upbraiding the misguided and malicious politicians of the Balkans for a veritable train of abuses against the lives, liberty and property of their own people and others. In the process, similar harshness has been employed against the agents of Empire, who have set to remake the fractious and complex peninsular tapestry by brute force and power of prejudice. Now one such agent seeks to apply his Balkans experiences at home, here in the United States, seeking the office of President – but in truth, coveting the laurels of Emperor. Wesley Clark, former US Army general and Supreme NATO Commander in Europe, announced Wednesday that he will run for President of the United States in 2004 as a Democrat, joining nine other Democratic candidates vying for the opportunity to challenge George W. Bush. Incongruously, Clark supporters and mainstream media seem to purport that he is running on an "antiwar" ticket. Only a few, including the Christian Science Monitor, believe that Clark could outflank Bush in his belligerence. 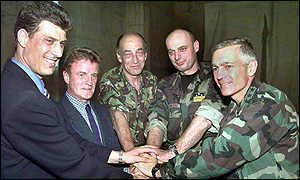 It's as if everyone has forgotten Wesley Clark was the Bomber of Belgrade, the highest-ranking military official in a cabal that systematically violated international law, the NATO Charter (and with it the US Constitution, Article 6, Section 2) and committed the greatest crime under the Nuremburg principles: that against peace. Even Michael Moore, the gut-punch filmmaker who challenged the NATO attack (after a fashion) in his Oscar-winning feature "Bowling for Columbine," recently gushed over Clark. What has possessed all these people to believe that the answer to George W. Bush's policy of Global Balkanization lies in a man whose hands are drenched in Balkans blood? "We're going to systematically and progressively attack, disrupt, degrade, devastate and ultimately, unless President Milosevic complies with the demands of the international community, we're going to destroy his forces and their facilities and support," he said. Systematically, he said. Destroy, he said. Facilities and support, he said. The bombing was indeed systematic – bridges, schools, hospitals, passenger trains, buses, refugee columns, marketplaces, anything that could be hit except the Yugoslav military, which successfully camouflaged its systems and avoided most attacks. Apparently, for Clark and his coterie, the "facilities and support" of the Yugoslav military were the people and infrastructure of Serbia itself, from the roads and bridges to the power grid and TV networks. One of the Nuremberg prosecutors warned in vain that war crimes laws applied to Americans also. Comfortable in their knowledge that no court in the world would ever touch them – proven later on by their ICTY pawns' abject refusal to even consider an investigation – Clark and Co. committed war crimes freely and often. Unlike Slobodan Milosevic, who was accused of "command responsibility" for alleged genocide and crimes against humanity in the Balkan Wars without a shred of reliable evidence, there is plenty of proof in Clark's case. That is, if there were an honest war crimes court in the world. Despite the barrage of propaganda, and a tailor-made "indictment" of Milosevic by NATO allies at the Hague Inquisition, the campaign of terror was failing. Only the intercession of a Russian government envoy and the "neutral" Finn Martti Ahtisaari (later amply rewarded by NATO supporters) convinced the Serbian authorities to make a truce with their attackers. No one knows whether Chernomyrdin or Ahtisaari knew that the Alliance had no intention of honoring the agreement, or the UN resolution that codified it. Russia tried to ensure NATO lived up to the bargain by sending troops to Kosovo. When the invading British troops encountered the Russians at the Pristina airport, Clark hysterically ordered British commander General Sir Michael Jackson to dislodge them by force. Jackson refused, reportedly saying, "I'm not going to start the Third World War for you." Events have vindicated Jackson's judgment; earlier this year, Russians completely withdrew from Kosovo, having failed to do anything but legitimize the illegitimate occupation of the province. For NATO's – and Clark's – "humanitarian intervention" in Kosovo has only ever been a crudely manufactured lie based on most despicable deception. BBC's profile of Clark's candidacy also claims that his "credentials for running against President George Bush in 2004 rest squarely on his military reputation." If so, that is great news, for Clark hardly has any. There is little respect for Clark among his colleagues in the military. An investigative report by CounterPunch magazine in 1999 reveals a man of gargantuan vanity, arrogant to subordinates and subservient to superiors, obsessed with micro-management, and politically savvy at the expense of military expertise. One officer who served with Clark termed him "The poster child for everything that is wrong with the [general officer] corps," and said that under Clark's command, the 1st [Armored] Cavalry Division at Fort Hood was "easily the worst division I have ever seen in 25 years of doing this stuff." "Known by those who've served with him as the 'Ultimate Perfumed Prince,' he's far more comfortable in a drawing room discussing political theories than hunkering down in the trenches where bullets fly and soldiers die." Wesley Clark boasts about "Waging Modern War," but he is hardly a Maximus Decimus Meridius. One would be tempted to compare him to Lucius Cornelius Sulla, but for the Roman tyrant's record of actual military competence. Some might protest that Clark was, after all, knighted by the British for his "boundless energy" in the terror-bombing of Yugoslavia; awarded the French Legion d'Honneur; and the U.S. Presidential Medal of Freedom. That these governments profaned their highest decorations in support of their criminal endeavor speaks more about their (dis)honor than about Clarks' alleged "accomplishments." Soon thereafter, they unearthed the names of the two officers, and it turned out Clark was not involved. So, Clark's defenders can say with pride that their champion did not rain death and destruction at demonized Americans, but only demonized foreigners. Let voters' conscience be the judge of such an ethical distinction. It is one thing to worship the fallen and false god of democracy by pretending elections actually mean something. But is the American public ready to take the next step, and start endorsing blood sacrifices? Wesley Clark has sacrificed many lives at the altar of power, and he will do so again. By now it is obvious that a vote for Bush/Cheney will be a vote for Empire. It should be equally obvious that a vote for Clark would have the same effect. The very fact that Clark walks free, that he is proud of what he has done, that he is running for President, is proof of the ethical abyss which seems to have engulfed the world. Clark's methods of "waging war" – approved by his superiors at the time, be it noted – hardly differ from those espoused by Osama Bin Laden: cowardly attack civilians with missiles and bombs, hoping their spirit breaks and they capitulate to your demands. Yet this man would be President.